• Blame is a ready outlet for anger, hurt and disappointment. It is always easier to point the finger at someone for our troubles than to consider our own roles in causing or maintaining the problems. • Having someone to blame allows us to maintain our self-image. In our own eyes, we can remain that punctual, efficient person we would be except for the interferences and inefficiencies of other people. • Blame is a reflex action. It's the first thing you say when you've been caught and you need to preserve your dignity. Remember the time you tripped over a loose brick left on the sidewalk and immediately cried out, "What idiot left that here?" • Blame is a convenient form of procrastination. To our own ears, the flimsiest of excuses can sound like a reasonable explanation when someone else is at fault. "I would build that bookshelf for you today if Ed had returned the tools he borrowed." • Blame can act as a defense. Shifting responsibility to someone else can be comforting. If only your parents had encouraged you, you could have become a really great dancer; if only your boss didn't demand so much, you'd have more time for those classes you want to take. • Blaming others is less painful than blaming ourselves. If we regret choices we have made in our lives, pointing the finger at someone else means we don't have to own up to our decisions, some of which might not have been the wisest. • Blame can be a potent psychological weapon. Making others feel guilty can give us a feeling of power. • Blame obscures the true nature of problems. As long as someone or something else is responsible for our feelings, our failures, our lives, we don't have to do anything. The problem is not ours, but theirs. The real problem with blame is that it holds us in the past and keeps us from moving forward toward growth. 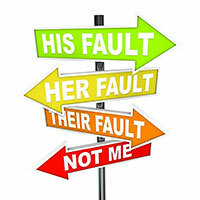 Blaming others allows us to remain in the role of victim, powerless to change anything. While we may not always have complete control over what happens, we do have control over our own reactions and emotions. One way to claim our lives is by taking 100 percent responsibility for what we feel. Rather than "you make me feel...," say, "I feel... when..."
Like using chewing gum and baling wire for a repair job, blame may be a handy tool, but it won't hold up over time. Using blame makes us forget we have power over how we live our own lives and that we're responsible for ourselves. Are you familiar with when and how blame entered into the world?